My mother, Jean Pilk, is 94. A woman of abundant gifts, she is blindingly talented. Jean is a nationally recognized portrait artist who still paints almost every day. She reads prodigiously and although we agree on nary a single issue of political significance, I respect her dogged tenacity in this arena. My mother practices yoga and walks in all weather, fair and foul. She is exotically attractive and dresses better than I ever will. Though she weighs in at a whopping 85 pounds (and that is fully dressed with a few rocks in her pockets), she has an enviable strength of both body and will. One thing my mother is not is a foodie. Jean is a child of the Midwest, a meat and potatoes girl, though truth be told, she exists almost entirely on sweets. Snickers, Almond Rocha, Peanut M&Ms, cookies, donuts, cake, ice cream, Circus Peanuts—the list is without end. If she can’t have sweets, she’s happy to stick to chicken fingers and french fries or a steak cooked medium well. I’m not sure if my love of food—eating it, preparing it, talking about it, writing about it—is a reaction to the simple meals of my youth or is just a fluke, one of the inevitable permutations of preference in a large and diverse family. In spite of my mother’s somewhat limited repertoire at mealtime, there are still dishes that live on, for good or ill, in family lore. They are indelibly imprinted in my memory and have the ability, in a single bite, to conjure up places and times long past. I found three of my mother’s go-to recipes that were particularly resonant in my memory. Of these, two were bland and benign. The third was—if I’m honest—an abomination. I felt it was my filial duty to take these recipes and reinvent them for the new millennium, to update these family “favorites” for a new generation. Holidays and cocktail parties in my youth meant cheese balls—cream cheese, maybe with a dash of Worcestershire sauce, rolled in chopped walnuts. At Christmastime, the ball was rolled into a cylinder shape and covered with nuts to represent a log. Log or ball, this sturdy and serviceable hors d’oeuvre was not the thing foodie dreams are made of. In my effort to re-imagine family food favorites, here are two of my favorite cheese ball iterations that are perfect to serve during the holidays. Combine all ingredients thoroughly and refrigerate for 2 hours or overnight. If you’re using white cheddar and want your pumpkin to be orange, add food coloring when combining ingredients. Form a ball with the cheese and make an indentation with your thumb in the top middle. You can use a twisted pretzel stick or a bell pepper stem for the pumpkin stem. Add a bit of cilantro for the leaves. My mom made these little nests with butterscotch chips and chow mein noodles. End of story. Here’s my updated version. Because…salted dark chocolate! Mix the peanut butter into the melted butterscotch and stir until blended and smooth. Add the chow mein noodles and peanuts and continue stirring until all the noodles are coated. Drop by small spoonfuls onto the waxed paper. Refrigerate until nests are hardened. Small nests are easier to eat. You can always go back for more! While the nests are cooling, melt the chocolate chips according to the instructions for melting the butterscotch chips. When the chocolate is thoroughly melted and the nests have set, spoon chocolate into a small sandwich bag and clip a corner from the bottom of the bag. Drizzle chocolate onto the nests. Sprinkle with a bit of flaked salt on each one. Combine all ingredients thoroughly and refrigerate for 2 hours or overnight. 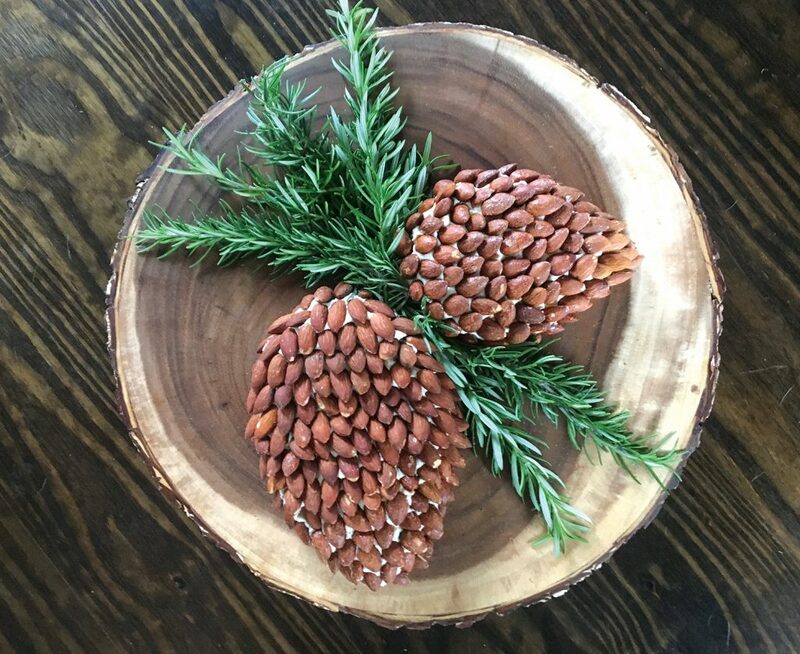 Create the pine cone’s oval shape on serving platter. Add almonds as pictured (pointed ends into the cheese) and use fresh rosemary to create the stem. Serve with crackers, pretzels or veggies. • Let your imagination loose when it comes to making cheese balls. A little horseradish adds great flavor. Pepper jack cheese makes a bold, spicy statement. Any cheese makes a fantastic cheese ball. • Don’t stop at these shapes. Try new ones of your own. A football shape covered in pepperoni would be a hit for any tailgating party. How about a heart shape for Valentine’s Day? • Mini cheese balls with pretzel stick handles are a fun way to change up your cheese ball game. • Cheese balls are best served slightly chilled or at room temperature. • If there’s any left over, try serving the remaining cheese ball with pasta. Cook pasta according to directions and reserve a bit of the pasta water. Put the drained pasta in a saucepan, add the cheese ball and pasta water and heat until melted.